Rhianna Pratchett thinks emphasizing the positives about being a games industry professional is as important as being honest about the negatives. 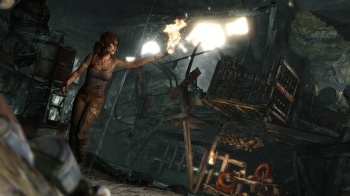 "For many years I steered clear of 'women in games' issues," says Rhianna Pratchett, writer of Tomb Raider. "I felt that the best thing I could do for women in games was just be one and do my job to the best of my ability." However she decided to go one step further, because she realized it was important that other women thinking about entering the industry see their peers talking about these issues. That's why Pratchett created the Twitter hashtag #1reasontobe, a means by which female developers were encouraged to share why they're in games and what they get from it. She does think that the games industry is in desperate need of a shake-up, and hopes this will start improving conditions for everyone, males and females alike. "We need to place stronger emphasis on improving working conditions, burnout rate and industry awareness," says Pratchett. "Ultimately, that's what will improve the quality of the games and the lives of those who create them." She wants to emphasize the positives, as well as talk about the negatives. The best way to reduce sexism in the industry, Pratchett feels, is to get more skilled women working in games, but poor work-life balance does huge damage to creatives, which in turn increases burnout and has a negative impact on the business as a whole. If people aren't aware of the opportunities out there, they'll get discouraged and quit; hence the need for a voice that reminds them there's a reason to be in the industry. If there's one thing Pratchett hopes will come of this, it's that talking about issues in the industry might encourage more real-world efforts to change things. "Words are great, but it's action that really matters," says Pratchett.